England, 1930s. 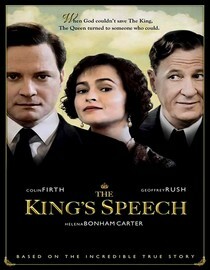 King George V (Michael Gambon) has died leaving two direct heirs to the throne: David and Bertie (Colin Firth). David is the obvious choice to rule, but as he is pronounced king, his romance with a divorced American woman causes quite a stir in the corridors of power. Bertie has always been on David’s shadow, but when powerful men begin to object his brother’s rule, it is up to Bertie to overcome his limitations and fears and rise to greatness. His brother abdicates and Bertie becomes King George VI. With the help of Australian speech therapist Lionel Logue (Geoffrey Rush), he overcomes a severe speech impediment and flawlessly delivers the speech that marks the entrance of Britain in World War II. This is a WOW kind of movie. At the theater when it ended everyone stayed on their seats, not talking, just there. There are many, funny lines in this film, but Colin Firth’s performance is a tour-de-force, so are Rush and Bonham Carter’s acting. The movie is a shower of acting greatness. Inspirational and moving are two other words that come to mind when describing this film. I will be rooting for this movie at the Oscars! Not to be missed!